It’s finally happening. The cold weather is slowly starting to leave us here in Jersey. This is the time of year that a lot of us collectors look forward to as we can start planning our trips for new pressed coins. I usually get a little over zealous and have trips scheduled for most weekend along with at least one week-long trip somewhere. But then reality strikes and some of the short trips need to be bumped or canceled. Something else that also starts to happen at least for me is that my friends and family start to let me know about trips they are taking. They know of my pressed coin collection and don’t seemed to concerned about being enablers and feeding into the obsession. Deep down I think they actually like the adventure of finding the machines and using the machines but they’ll never admit it. The downside of this knowledge is that I can easily go overboard requesting they collect every coin within a 100 mile radius. However I really do feel guilty sometimes as I know how my own vacations are schedule and there isn’t always a lot of extra time available. Usually I end up just picking a few machines that are as close to where their hotel is or a theme park, zoo or other attraction they are already visiting. I never want them to have to make a special trip just to use one machine that worst case scenario may be out-of-order. Over the years I have come up with different ways to ensure my friends and family have enough coins to press, and now even take the time to get images of the coins I’m looking for. I’m mentioned in the past that my parents are big New York Mets fans and go down to Port St Lucie in Florida for Spring Training Baseball season. This years trip has them in Port St Lucie for the first half of their trip and then they are heading to Orlando. 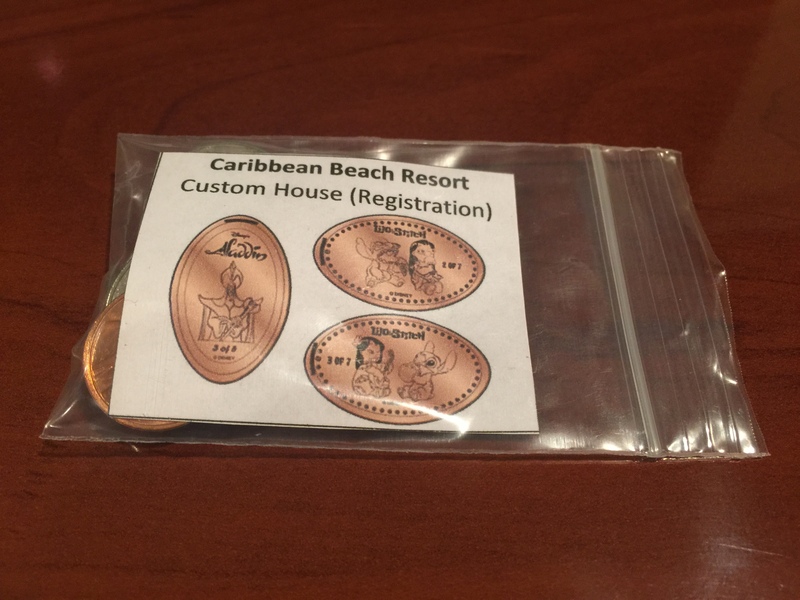 The picture above is of the package I created for them as they informed me they would be staying on Walt Disney Property for a few nights at the Caribbean Beach Resort. Everything is put into a gallon size ziptop bag for easy storage and can just be placed in their luggage. 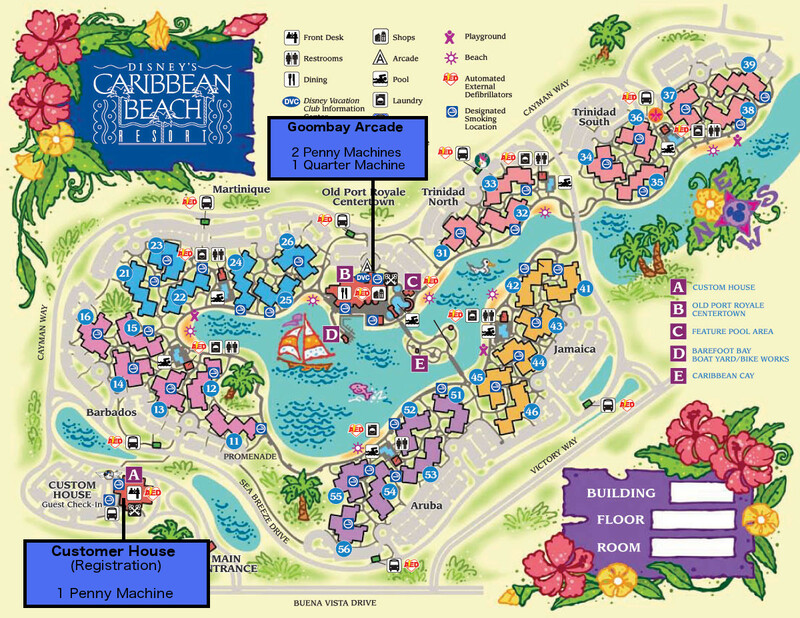 One of the first things I did was do a google search for a copy of the resort map. I use just basic photo editing software on my computer. 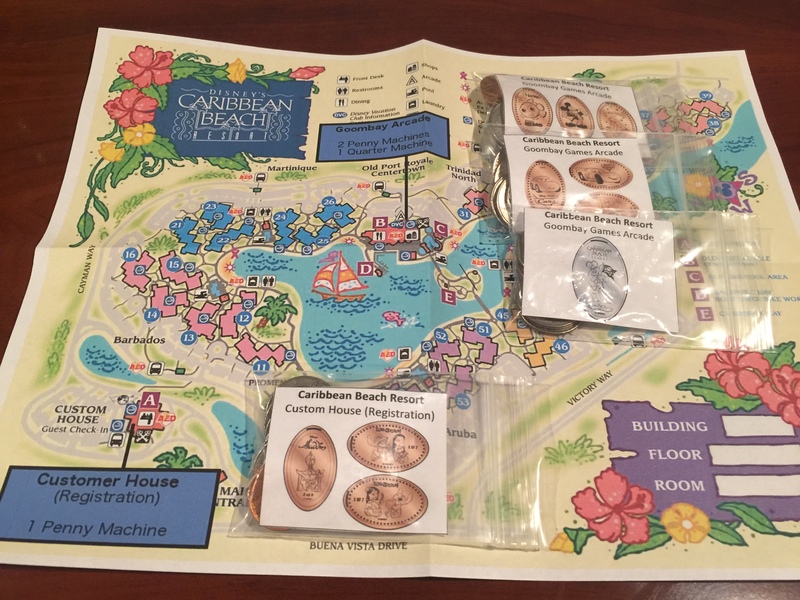 As you can see above I then insert boxes with the locations of each machine and some details about the coins located there. Next using my computer’s word processor I create the above table. This is really just to help keep everything spaced and organized. 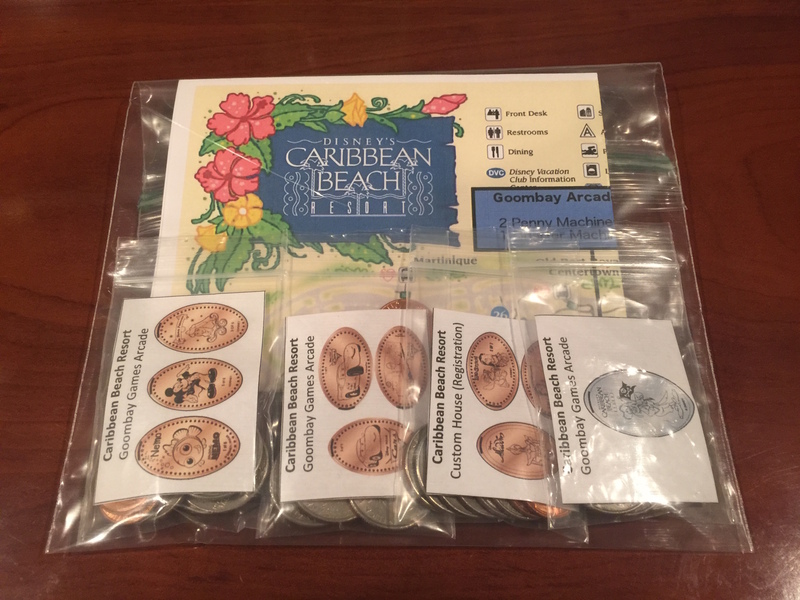 In each box I list the location and then grab a picture of the coins from various websites available online. Once printed I then cut out each box and insert it into little ziptop bags that have the appropriate number of quarters and pennies needed for that machine. In the past I know my friends and family mean well but sometimes a location would have multiple machines and they didn’t always understand my hand written notes. This was something I started doing just a few years ago and it has worked like a charm. Obviously there is a bit of work to be done on my end but to me it’s all part of the fun. Once I have the map completed and all the little bags filled I always double-check them with each other to make sure I didn’t overlook something. Then I fold it all up and put in the larger ziptop bag. All that’s left is to wait for them to return so I can see how they turned out. 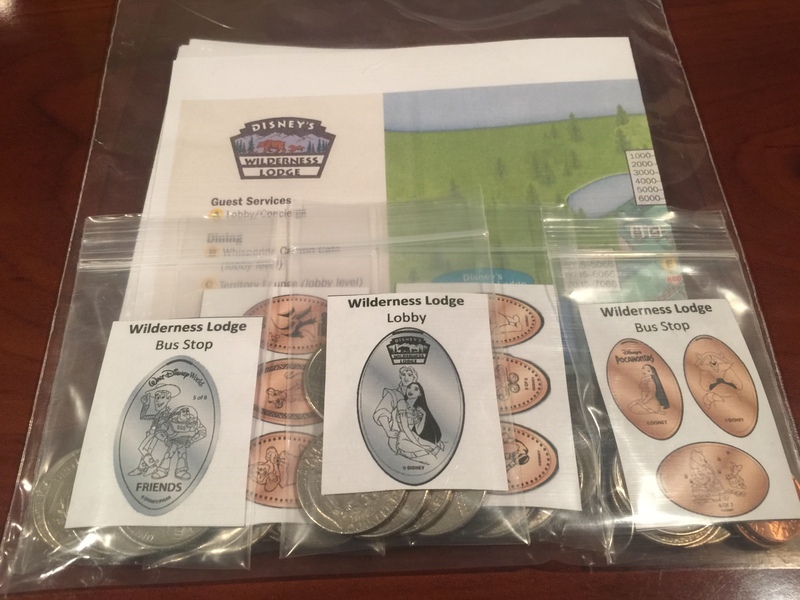 I have a friend at work that always goes to Walt Disney World around July 4th and stays at the Wilderness Lodge Resort. In anticipation of her trip I already put together a package for her which is pictured below. This is a little risky to do this far in advance as the coins can change at any time but I always like to try to be as prepared as possible. These two above examples just happen to both be for Disney, but I do the same for other attractions. Most zoos, aquariums and theme parks have digital versions of their maps available online that I just download and use the same process listed above. 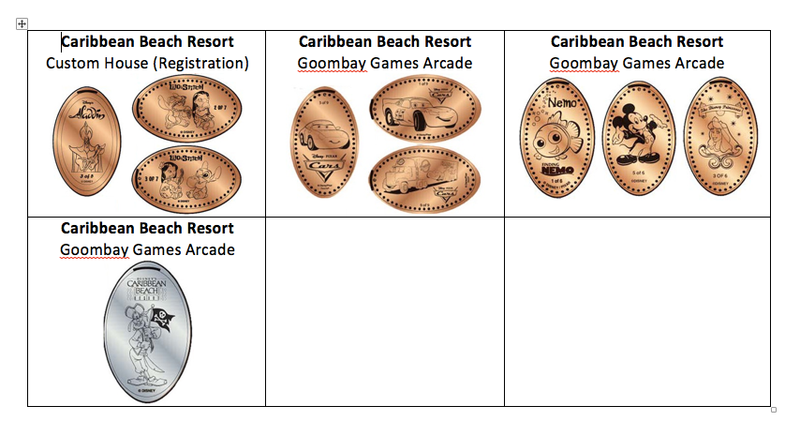 I’m always very appreciative to all my friends and family for taking the time out of their vacations to press some extra coins for me and the least I can do is make it as easy for them as possible. Hopefully it doesn’t take up too much of their time and they can get back to what they had originally intended to do.